Prototypes are great blueprints for design and development, but sometimes you need a real specification document, which can include much more than just screenshots of your prototype, e.g. explanations, functional requirements and things invisible on the screenshot, such as interactive behavior. 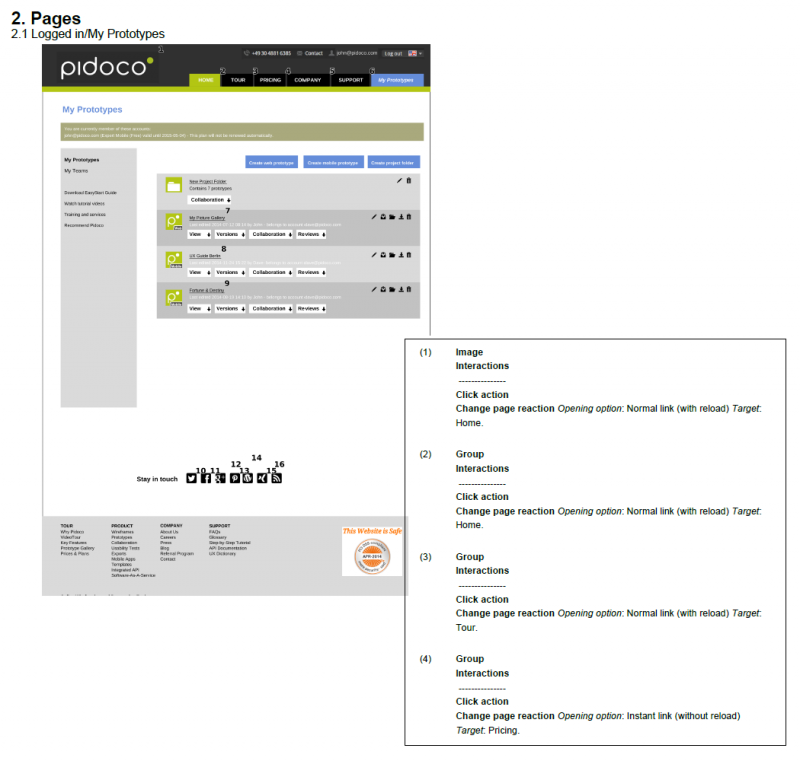 Pidoco allows you to generate such specification documents with only a few mouse clicks and gives you some powerful options. This post takes you through the set-up and export of your specification document. To generate a specification document start by picking the document format. To do so, open your prototype and select PDF Export or RTF/Word Export from the “Export” dropdown in the toolbar. Pick the PDF export if you want to generate a final, non-editable document, e.g. for final approval. Pick the RTF/Word option if you want to be able to edit the specification document later. The content will be the same in both cases and can be determined in the next step. Hint: If you have your existing specification template, you can embed screenshots of your prototype pages as direct links that you can easily update via the respective function, e.g. in Microsoft Word or Powerpoint documents. You can find the respective links in the “Share” dropdown in the toolbar. Next, a dialog window will open up and allow you to choose what parts of the prototype should be included in the specification document. You can select individual pages to include and opt to include additional information. To do so, simply toggle the respective boxes. 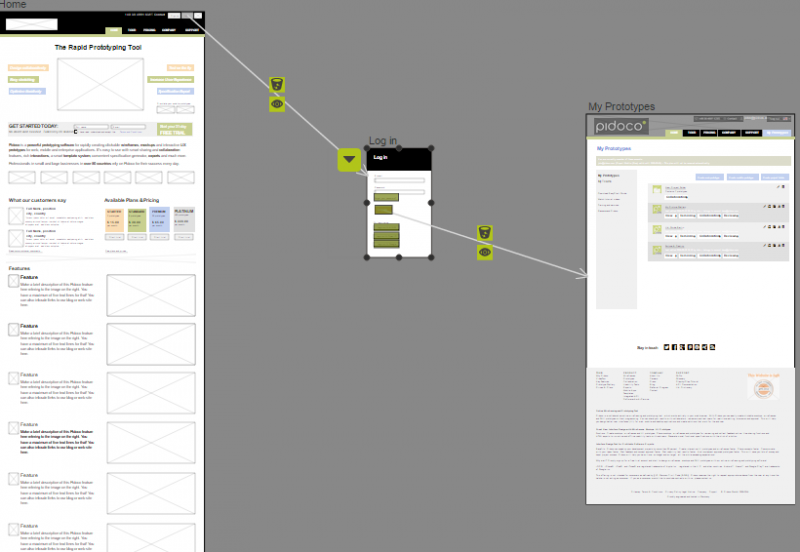 Screenflows help you visualize processes (e.g. 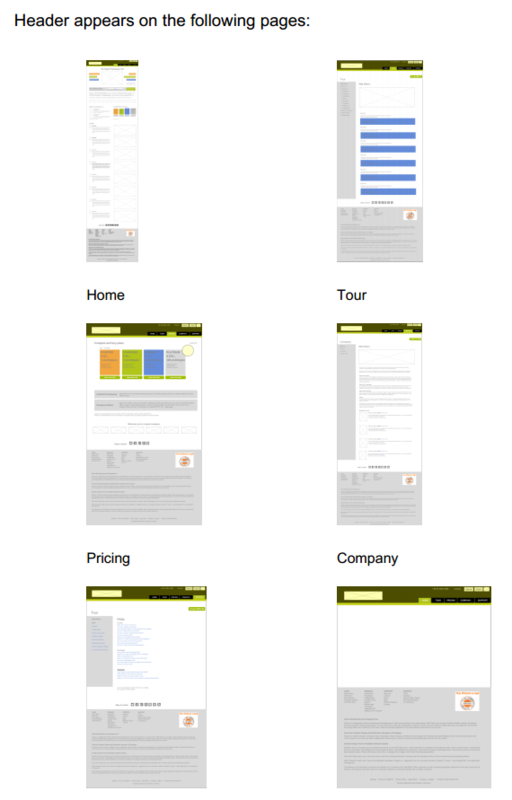 the log-in process of your website), demonstrate use case scenarios, depict hierachichal structures (e.g. 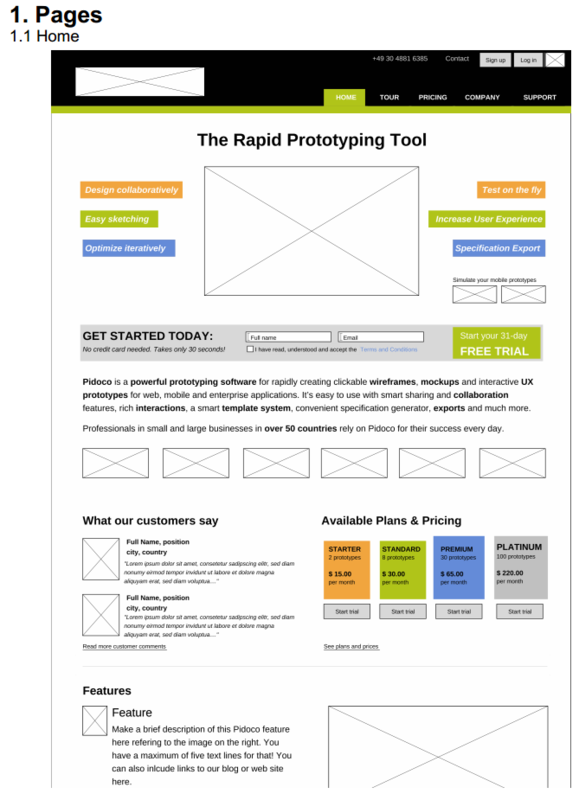 a sitemap) or simply give the reader a quick overview of the pages your prototype contains. If you have created screenflows and want to include them as screenshots in your specification, select this option. Screenflows are shown in the first chapter of the specification document in alphabetical order. Example of a screenflow showing a log-in process as appearing in the specification document. Usually, you will want to include some of all of the pages of your prototype, but you can also select just individual pages, for example if you have experimented with several versions of a page, but only need the winning candidate for the specification. Pages are shown as full screenshots in the specification document and appear in alphabetical order, grouped by folder. Pages appear in the second section of the specification document, right after the screenflows. For optimal legibility, the screenshots are automatically scaled to full page width. Long pages may therefore be split up across two or more pages in the specification document. 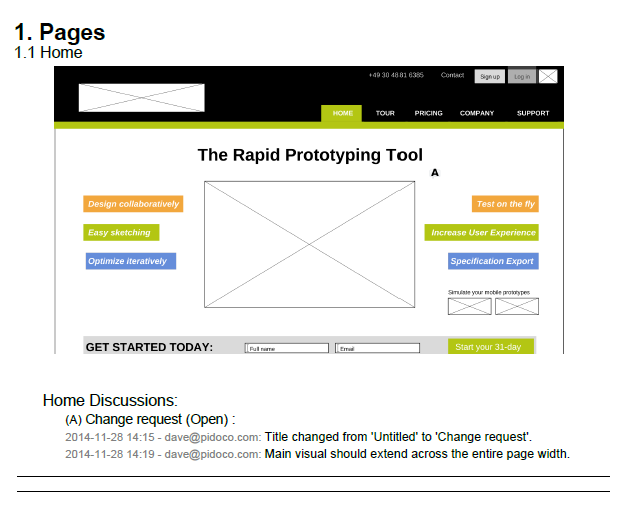 Prototype pages are listed under “Pages” in the specification document. Hint: The Comment stencil lets you post notes into your prototype pages that are useful to explain details you don’t want or have the time to prototype. You can change their visibility in the specification document (and simulation) via the Context Menu. If you are working with layers, you may want to include them in the specification document, for example to show which building blocks make up your prototype and are repeated in various locations. Layers appear as screenshots in the third section of the specification document, right after the pages. Select “Include page -> layer references” to show all layers in use on a given page after each page in the pages section of the document. If you select “Include layer->page references”, you will find after each layer in the layer section of the document a list of all pages containing the respective layer. This can be very useful information for the developers when trying to understand how the software will work or deciding how to structure the code. Layers are shown in the last section of the specification document. The “Header” layer is used on six pages. Including pages in the specification document (see above) will only give you the screenshots of the respective pages, but since the specification document is not interactive like the simulation, there may be some vital information missing. Imagine a dropdown menu: You will only see the first entry in the screenshot because the menu dropdown can only be shown in one state, but the developer will need to know all the other entries as well. Element configurations, e.g. contents of a dropdown menu or states of elements. This information can easily be copied from the document for reuse. Page details will be listed below each page in the specification document and referenced in the screenshots by small numbers (1, 2, 3, etc.). Page details are referenced on the page screenshots and provide information not directly visible in the screenshots. Hint: To add annotations to an element, open the context menu and type into the text field at the bottom. Discussions containing feedback and change requests or further information can be displayed in the specification document, too. This helps you visualize the progress of the project and document the decision-making process. It can also be immensely helpful in resolving arguments with clients about who requested a change or why a certain feature was implemented in this particular way. Discussions will be references as letters in the screenshots of the respective pages (A, B, C, etc.). Discussions can help track and document change requests and decision processes. Finally click on the “Send” button and, depending on the size of your prototype, you will receive the specification document a few minutes later after the automatic download has been completed. You can customize your specification document to the needs of the different recipients. A client may need different information to sign off on a concept or approve a budget than the developer writing the code, so it can be useful to include only selected sections in the specification document. Whatever configuration you choose for your specification export, Pidoco will remember your last setting, so you won’t have to redo it every time. 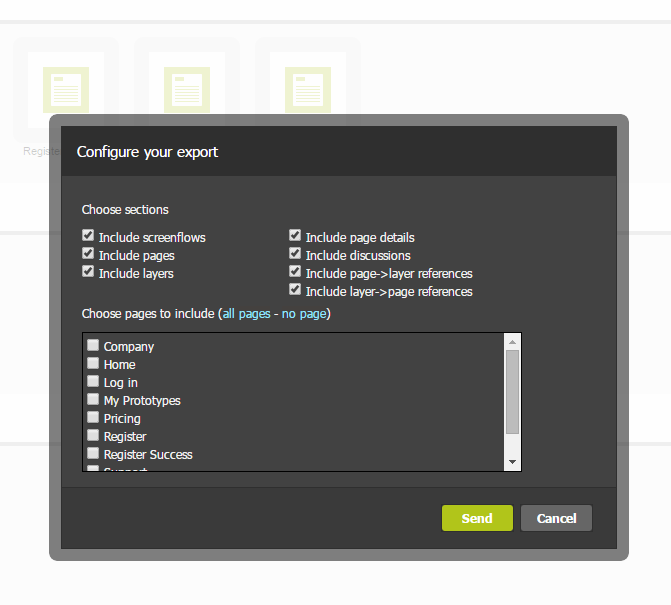 Once, you have your document set up, one click on the “Export” button in the toolbar will suffice to generate your spec. That’s it! You have successfully created your first specification document! Do you need help with your specification document? Just send us a message via support@pidoco.com or Facebook, Twitter or Google+.